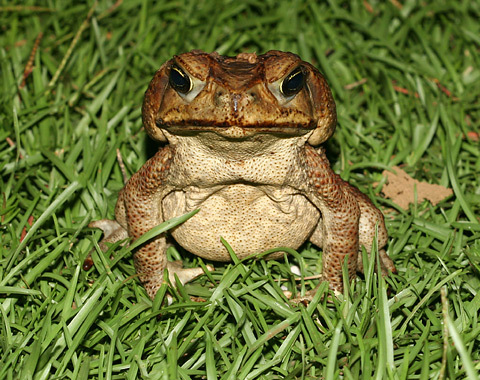 As we wage war on our possums, stoats, rats to save our precious feathered friends, lets think of our Aussie counterparts, who are battling the menace that is the cane toad (Bufo Marinus). Plucked from Hawaii and transported to Australia, these toads were used in agricultural pest control to wipe out cane beetles in 1935. They failed. Now, Aussies have a poisonous killing-machine on their hands. An animal that breeds rapidly, eats voraciously and kills most animals that tries to eat it, including freshwater crocodiles, kangaroos and household pets. Cloaked in the kind of jargon used to flog insecticides, Toad Day Out was an opportunity for Northern Queenslanders to collect up these remarkable predators, and win prizes (not big ones though, this wasn’t exactly a bounty killing). There’s something quite Maoist about mobilising the public to wage war on pests, and it only takes a quick look at some of the new reports to feel the sheer camaraderie amongst the group, as they collectively battled this much-loathed foe. While red-blooded Australians needed little more than a rather weak slogan to get them to spring into action, our job is a little trickier, not least because our pests can’t be ‘collected’ like toads, and let’s face it they’re cuter. However, amongst the general public in NZ, I think there is a certain apathy towards actively removing pests and saving our winged wonders, unless the threat of extinction is just-around-the-corner. Let’s just say, I can’t see hordes of city-ites abandoning their lattes, venturing into our forested parts, chanting the catch-cry ‘two legs good, four legs bad’. So how do we mobilise people to ensure we have bird-filled forests in the future, given DOC’s increasingly tight budget, and 1080’s unpopularity? National Tramp n Trap days? Ferret Away days? P.S Queenslanders most recently upped the ante by deploying thousands of meat-eating ants to prey on the cane toads’ young. Another ecological curve ball may be coming their way, however, scientists are hoping that because these ants are native, they’ll be less likely to throw nature out of balance. I’ve had some luck with the “bogan solution” – open the block up to hunters and encourage gun-happy kids to have a go at anything that moves. It got rid of the pigs and deer, but the *&*&! goats keep coming back. To a degree you just have to accept that the animals are territorial and if you create an unoccupied territory something will move into it… so I see my block as a pit into which the local pest species disappear. Possums, cats and dogs fall to 1080 used correctly. One advantage of a rural block is that neighbours are more inclined to agree that if their dog got to my poison they failed to tie it up properly. I pity those nearer to towns who don’t have that sympathy available . Let’s hope the ants help and that it won’t backfire. How about holding a Possum/Ferret Hunting club? Or do we already have one? Well, if we do, the only thing better than one is two! Hey, that rhymes!